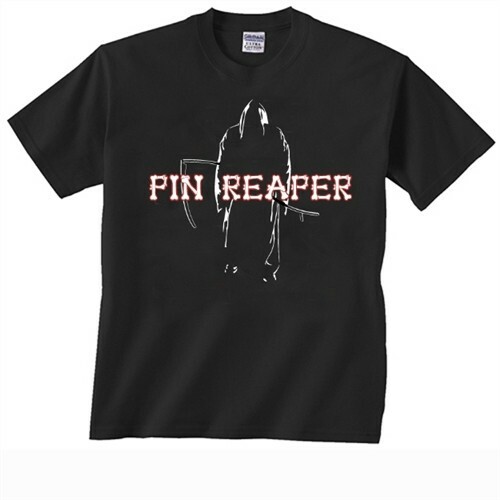 Scare the pins to death when you walk in wearing the Exclusive Pin Reaper T-Shirt which you can only buy at Bowling.com! Hi Kevin! It is indeed red coloring. Are these 100% cotton shirts pre shrunk or shuld i buy the next size larger in case of shrinkage? Hello Nancy. These shirts will just be 100% cotton. These are not preshrunk. Due to the time it takes to produce the Exclusive bowling.com Pin Reaper T-Shirt ball it will ship in immediately. We cannot ship this ball outside the United States.